Lampreys are jawless fishes, sometimes called living fossils because they strongly resemble fossils of ancient lampreys. They superficially resemble eels and have long, scaleless bodies, but have very distinct anatomy. In contrast to jawed vertebrates, lamprey are missing several traits like jaws, paired fins, and aspects of their nervous system. Together with the hagfish, they comprise the cyclostomes, sister group to the jawed vertebrates. The phylogenetic position of lampreys make them important experimental models for studies of vertebrate evolution and development. The enteric nervous system (ENS) of jawed vertebrates has millions of neurons that together regulate the many intrinsic functions of the gut. The vertebrate ENS is thought to arise predominantly from a specific cell type that is unique to vertebrates, from a subset of neural crest cells called vagal neural crest cells that migrate from the caudal hindbrain to the gut. They continue to proliferate as they migrate along the gut in an expanding wave of cells. Development of the ENS hadn’t been examined in lamprey, and it was unclear whether a vagally-derived ENS is a synapomorphy of all vertebrates. To study lamprey embryogenesis, we must work within their normal breeding season, which is limited to summer months. We are lucky to receive pre-breeding adult lamprey from the Great Lakes Fisheries Commission, who are primarily tasked with eradicating invasive P. marinus. They catch lamprey while they migrate upriver to spawn, and ship them to us overnight. Fig. 1. Introducing lamprey into our tank system. 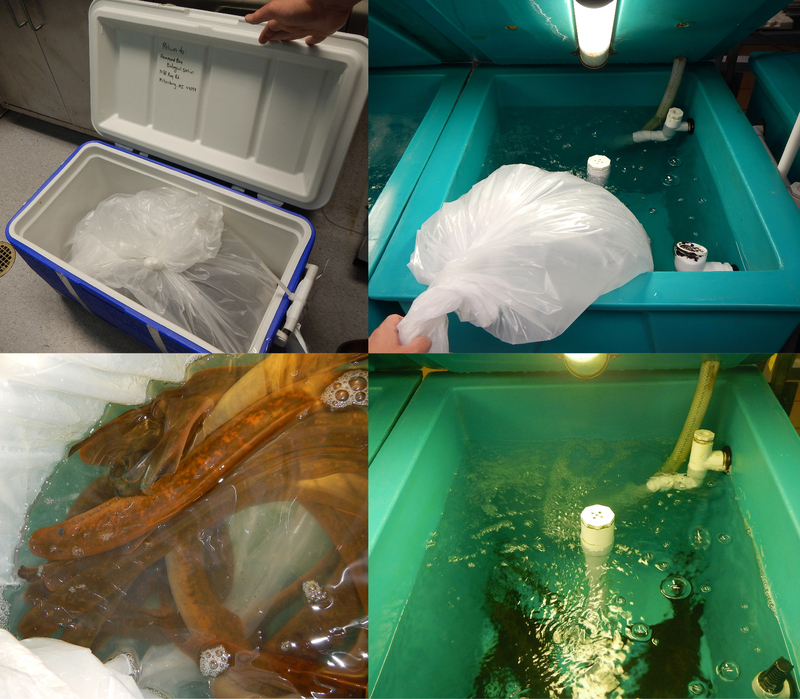 Lamprey are shipped overnight, in oxygenated cold water. We equilibrate water quality as much as possible before releasing the lamprey into the tanks. Once the lamprey are acclimated to the tanks, we artificially trigger their sexual maturation by increasing tank temperatures. Each mature females produces many thousands of eggs. We isolate gametes by squeezing the adult, then perform in vitro fertilizations. Fig. 2. Lamprey embryos at successively older stages. Embryo at top left is about one week old, and embryo at bottom right is about a month old. 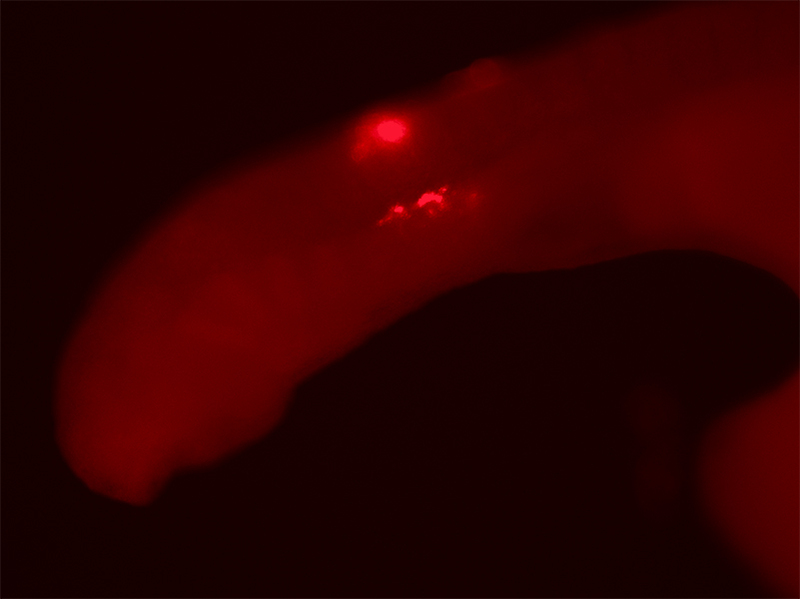 For this project, we sought to label lamprey neural crest cells with a dye, called DiI, which adheres to cell membranes. We first injected a small bolus of DiI in single spots in the vagal region, but we didn’t see cells migrate in a pattern consistent with the vagally-derived enteric neural crest observed in other vertebrates. Fig. 3. An example of DiI injection. A large bolus of DiI was injected into the caudal hindbrain region of the embryo, and a subset of neural crest cells from that region have migrated ventrally to the posterior pharynx. We then performed DiI injections that marked a larger region of the neural crest in the trunk and also performed surgical resections of this region to show that there was a contribution to enteric neurons from trunk-derived neural crest cells. These cells appear to migrate into the gut at quite late stages, similar to a population of neural crest cells in mice called Schwann Cell Precursors (SCPs). Our work suggests that SCPs may have been present in stem vertebrates, and that they might have been an original source of enteric neurons in vertebrates, with vagally-derived enteric neural crest cells evolving later. You can read our paper in Nature here.